2017 is almost done, and it's time for our traditional look back at what we accomplished this year. 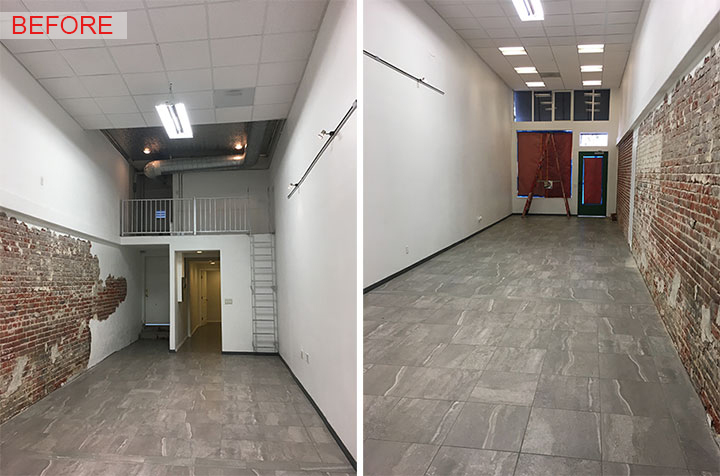 Here are just a few projects we completed in 2017, accompanied by some pictures of the same spaces before they were transformed. A cosmetics store, a crepes kiosk and a car wash may not have much in common, except when they grab the attention of passers-by with their unique design. Read below how we accomplished this, one square foot at a time. 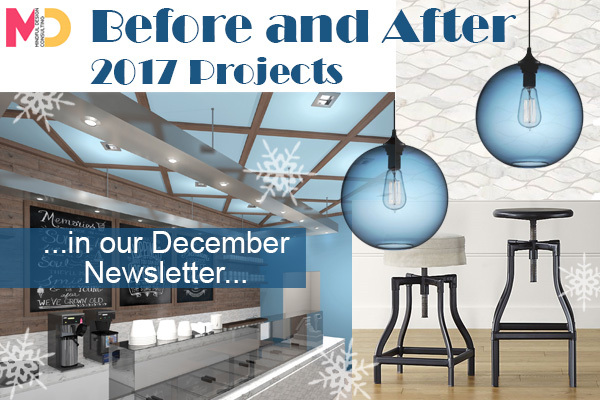 If you missed it, read our October newsletter that talks about light fixture trends. 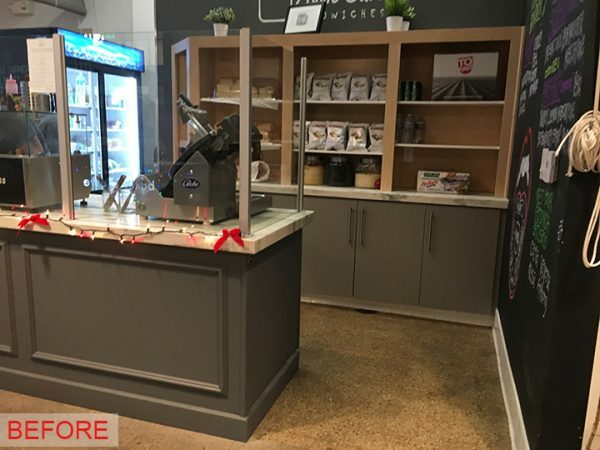 Mixing the concept of beauty and dessert, Beauty Bakerie is a mouth-watering cosmetics store in Westfield Mission Valley shopping mall, San Diego. 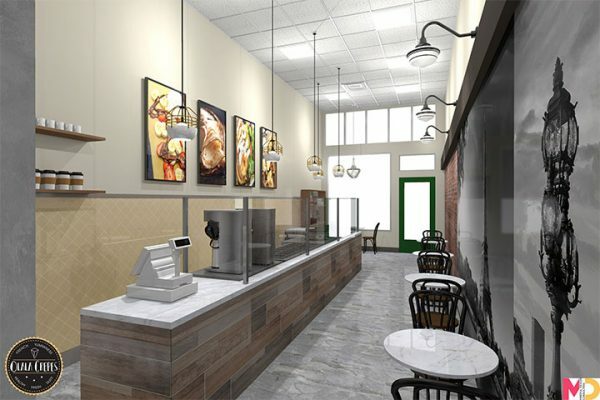 In creating this space, we used a subtle way of stimulating an appetite for shopping. Set against a vibrant pink, tan and turquoise background, the products are displayed as in a dessert store, in a lush and appetizing display of colors and textures. And here is how the project started, see an image below. The previous store was lacking any identity and had terrible lighting. Read more about Beauty Bakerie project in our Blog below. 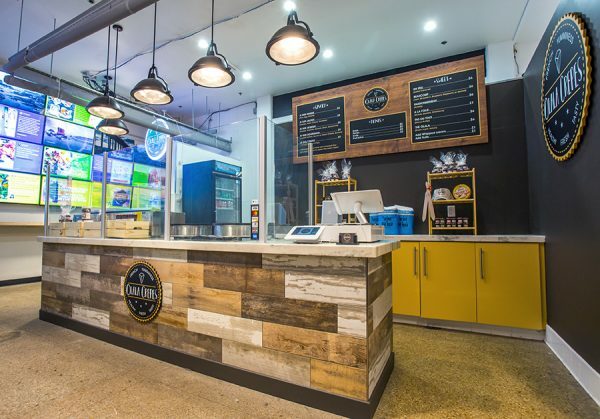 Designed in the crafty hipster style, the Olala Crepes Kiosk located in the heart of San Diego Liberty Public Market mixes the warmth of wood with that of a brown-centered palette to create a cozy, inviting ambiance. 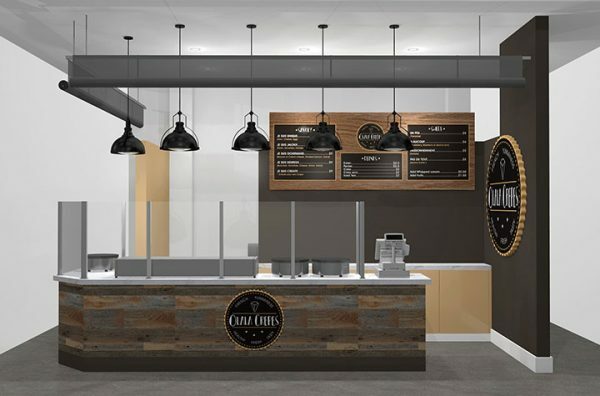 The earthy, rich tones of brown are comforting yet sophisticated, making the customers feel at ease and pampered. 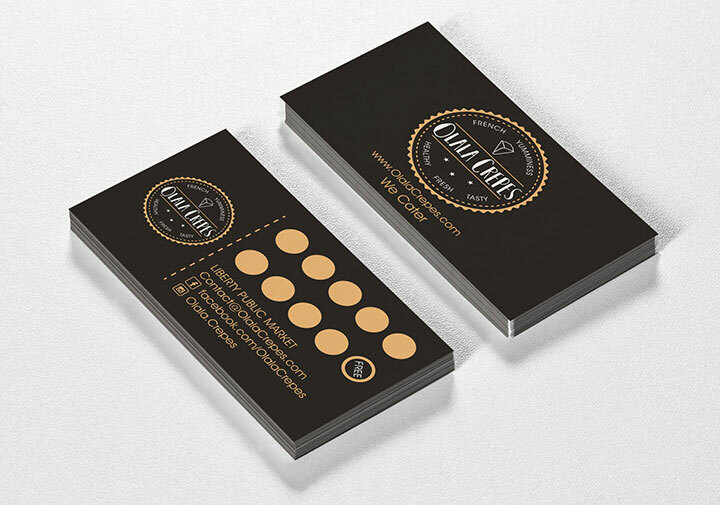 We also designed the Olala Crepes logo, as well as their business and loyalty cards in a simple, playful manner that corresponds to the image the business wants to project. 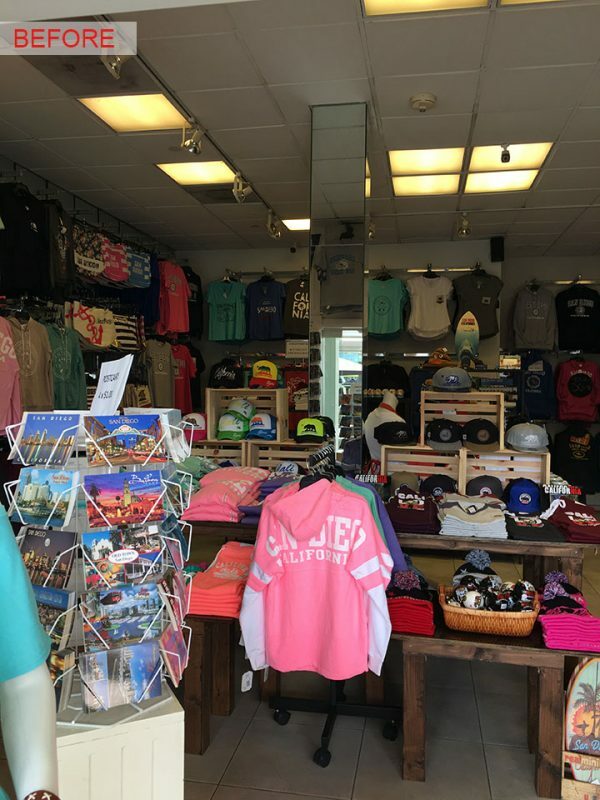 Below is a before image of the kiosk's location. 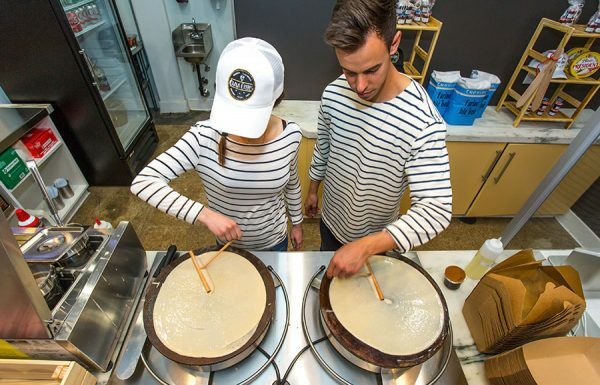 Read more about Olala Crepes in Liberty Station in our Blog below. 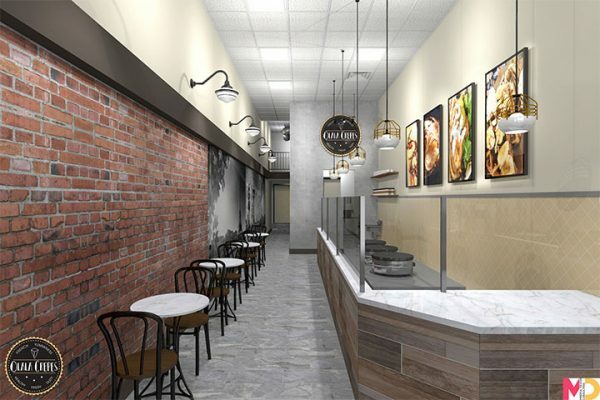 For a second Olala Crepes location in San Diego, we developed the initial concept by introducing French-inspired elements into the design. Brick walls with sconces reminiscent of street lights evoke the cobblestone streets of Paris. Oversize images of famous Parisian sights create the feeling of a French bistro. We turned a narrow, uninspiring space into a charming yet laid-back hang-out place. 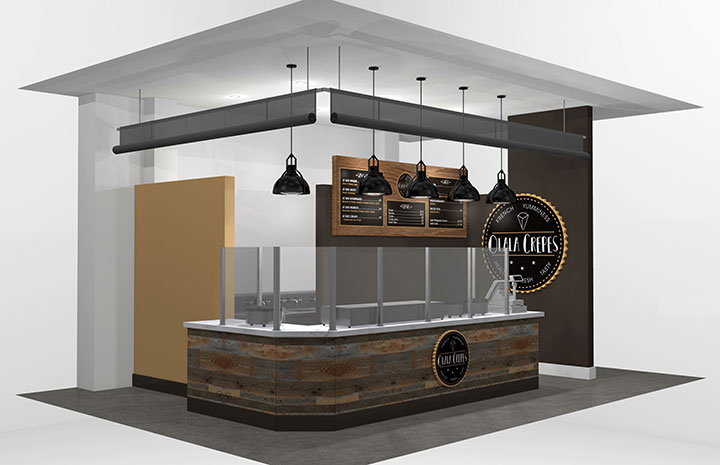 Read more about Olala Crepes 2nd location project in our Blog below. 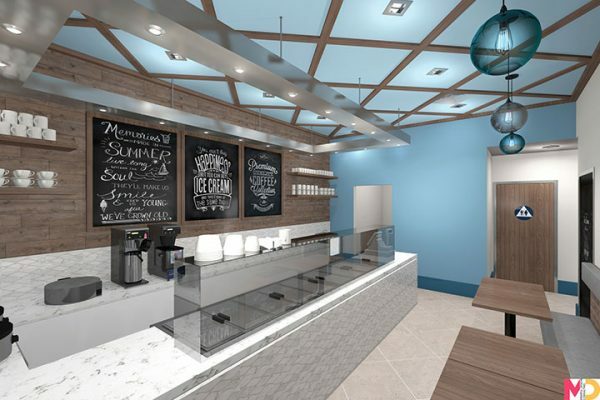 We wanted the interior design concept of Scoops, a hip ice cream store in La Jolla Shores, San Diego, to capture the beauty of the ocean and of this fortunate location. Designed in a chromatic palette that evokes the colors of the sand and the ocean, Scoops mixes rustic and industrial details for a place that satisfies contemporary tastes while remaining warm and inviting. 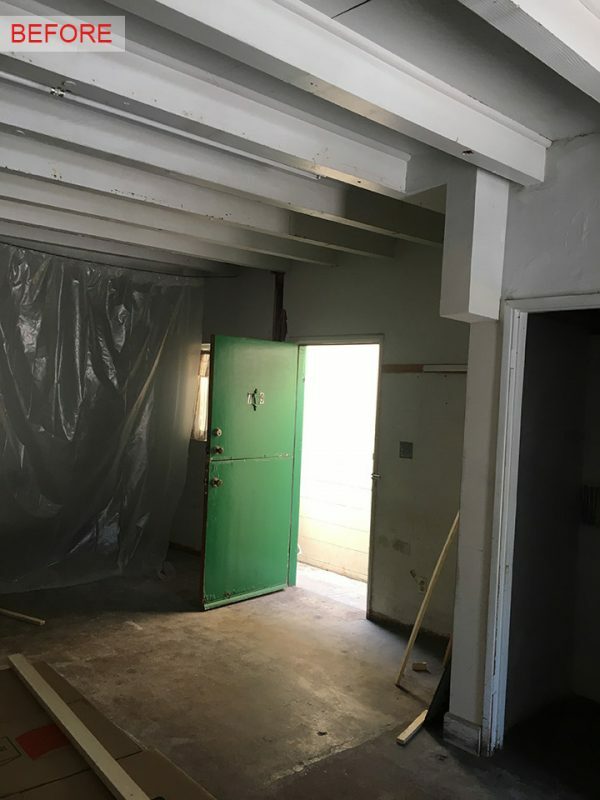 Below is a photo of the same space before. 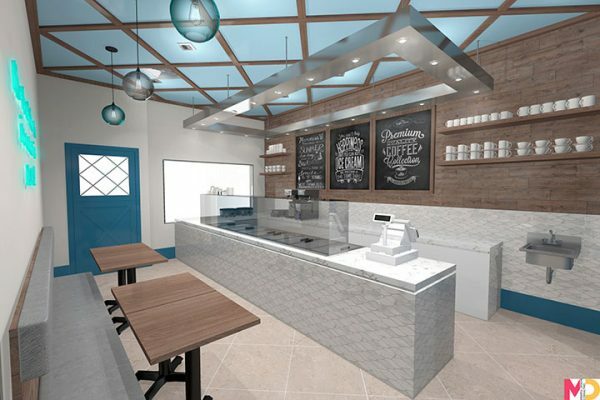 Read more about Scoops Ice-cream in La Jolla Shores project below. Nobody said car washes have to be boring and uninspiring. Using bold tones of orange and blue against a neutral background, we created a concept that attracts the eye with its surprising details. 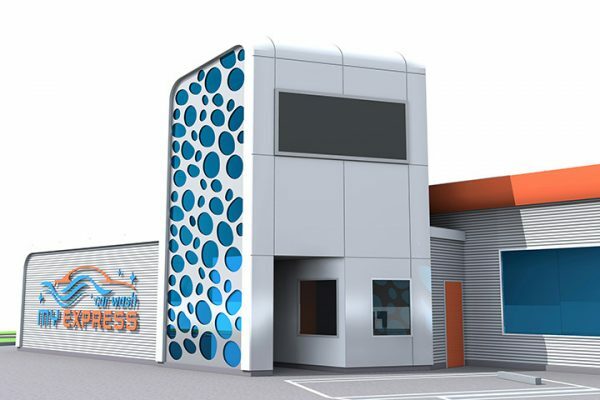 The design of My Express Car Wash in Compton, Los Angeles area, makes use of perforated exterior metal panels to introduce an artistic element into the mix. 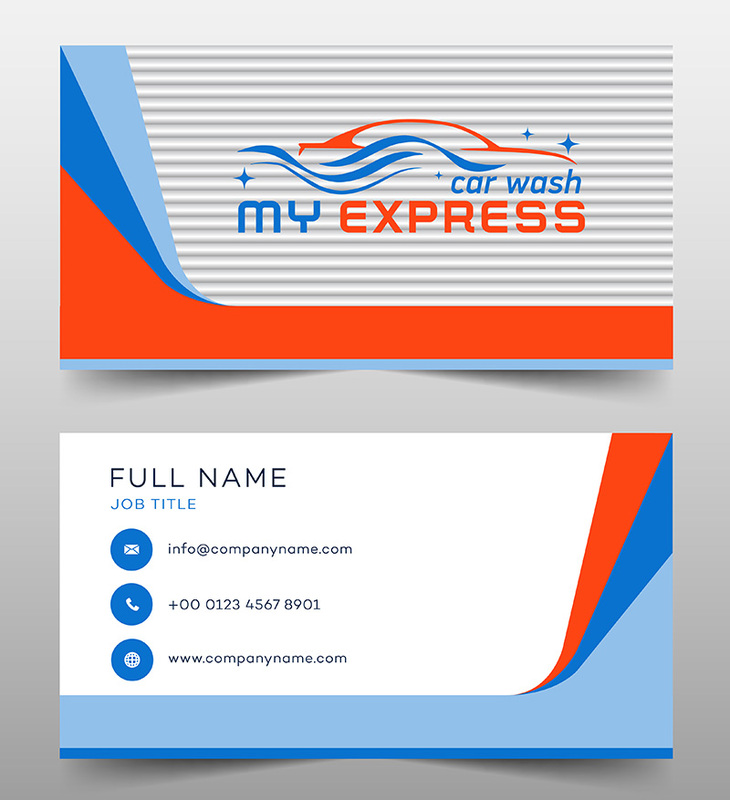 We designed the company's logo and business cards in the same colors and with the same modern vibe. Below you can see the lot where the future car wash will be built. 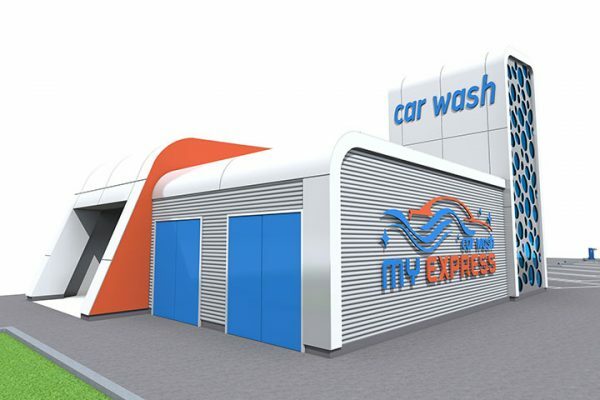 Read more about My Express Car Wash project below.